I could say we saved the best for last, but I just love each and every #healthiestholiday treat equally too much. 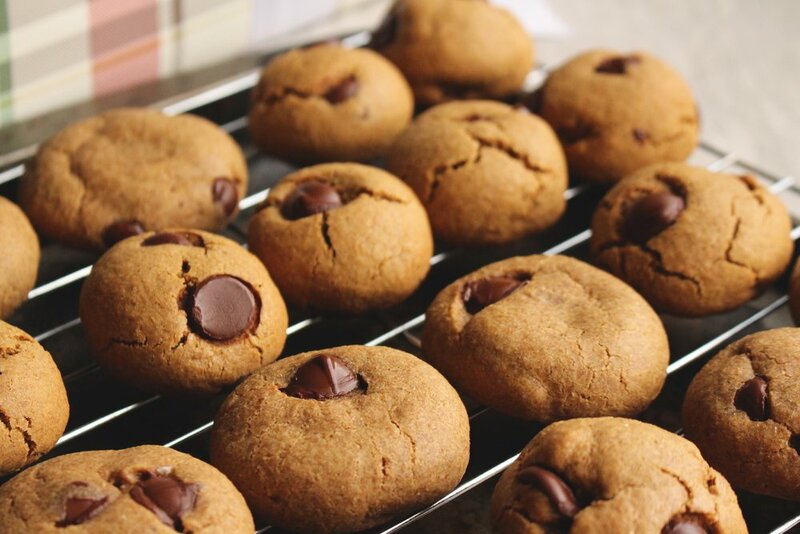 The last healthy cookie recipe on our list is the one and only, chocolate chip. And if I do say so my self, this recipe just happens to be the best healthified chocolate chip cookie recipe out there. You might even say so yourself. When it comes to health-ier chocolate chip cookies, I'm looking for ingredients that maximize flavor, without compromising texture and nutrition. We've all tried the ol' "3 ingredient healthy banana cookies," only to be left with bland, rubbery, cookie-like imposters that leave us wishing we would've just made the real thing. With that, I decided to shift my focus away from low-cal options, and use as many real food options as I could. For this recipe, and (almost) every holiday recipe thus far; I use coconut sugar or maple syrup in place of refined white sugar, whole wheat flour or coconut flour in place of AP flour, and I use butter or coconut oil in place of shortening or lard. The calories may be higher than recipes that call for sugar free sweeteners and refined white flours, but they are packed with nutrients and real food ingredients that your body will recognize and easily digest. Though it has a bad rap in the health industry, butter is my fat-of-choice for baked treats. If you're thinking, "You've lost your mind and how is this a healthy living blog??" - hear me out! Much like coconut oil, butter is a saturated fat that contains butterfat, milk proteins, and water. It's a natural product that is derived from cows milk and can be harmlessly incorporated into a healthy diet. Butter is a fat and fats do contain more calories per gram (9 cals/gram) compared to both protein and carbohydrate, however; higher calories doesn't mean unhealthy. Coconut oil, olive oil, avocado oil, etc. are all higher in calories but many health gurus use them daily. Unfortunately, butter was one of the only used saturated fats when fat was labeled as the precursor for dietary illnesses, so of course it was shamed, shunned, and furthermore forgotten about in the health industry. In reality, butter is not the lone culprit in this very complex epidemic and shouldn't be completely omitted unless required for health reasons. Brown butter also has a deeper flavor than off the shelf butter, which makes it a perfect cookie ingredient! I love anything that adds a rich, dark flavor to my cookies. I was looking to make the ultimate chocolate chip cookie and I believe brown butter has done just that! 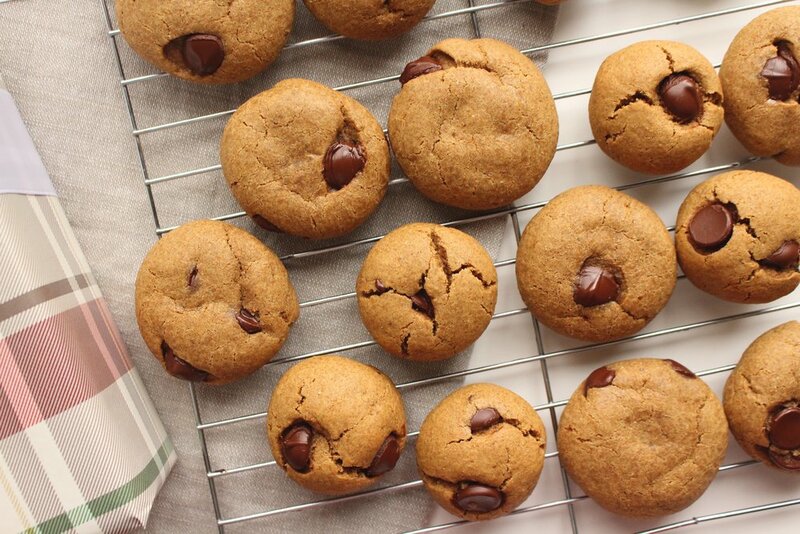 These cookies are chewy, flavorful, and better for you than you might think. If you're looking for the best guilt-free chocolate chip cookie, I think these are it! I hope you love this recipe as much as we do! To begin, heat 1 stick of unsalted butter over medium heat for 10-15 minutes, stirring consistently. The butter will begin to foam and deepen in color. Continue to heat until the foam has dispersed and the butter is oil-like. Remove from heat and let cool for at least 20 minutes before using in this recipe. *This step is very important to ensure you don't cook your eggs or burn your sugar! While your butter is cooling, prepare your dry ingredients by adding the flour, salt, baking soda and baking powder in a large mixing bowl. Whisk together and add 1 tsp. of cider vinegar. Set aside. In a separate mixing bowl, cream together coconut sugar, maple syrup, eggs, vanilla extract and cooled brown butter. Mix well until fully incorporated. Add dry ingredients into the wet ingredients and fold together. Finally, add 1/2-1 cup of chocolate chips, chocolate chunks, or M&M's to the cookie dough. Let chill for 20 minutes. Heat oven to 350ºF and line a cookie sheet with parchment paper. Remove cookie dough from the fridge and roll into 1-2 inch balls. Place on the cookie sheet and pat down for flatter cookies. Bake for 8-10 minutes or until golden brown in color. Remove from heat, place on a cooling rack and enjoy!